For three years, Valley View 365U Spanish teacher Hans Lunger has run his own blog, The Very Happy Bolingbrook Christian. He's defended moderate and liberal Christian beliefs on the blog. As a joke, he posts pictures of himself in a suit and ties at various parties. He says it's to play off the stereotype that serious Christians are boring. While he's engaged in a few theological debates online, he says he's never had a problem separating his blogging from his professional career. Until two weeks ago, when he made one fateful post. 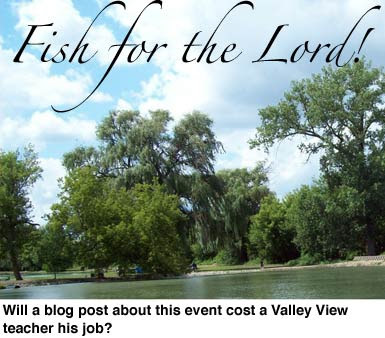 Lunger noted on his blog that the Illinois Pagan Family Institute was urging its followers to avoid Hidden Lakes Historic Trout Farm because a Christian group was holding an event there. Called Fishing for the Lord, Christians from various dominations were going fish at Hidden Lakes while wearing crosses and pro-Christian apparel. The IPFI objected to the presence of crosses at the private event because children shouldn't be exposed to "brutal instruments of torture!" Lunger wrote, "They're being silly. Secular people wear offensive symbols all the time, and it doesn't bother me. What would make this event better is if someone would walk by (Coven Leader) Hecate's home carrying a cross." Lunger then added that Hecate was free to do what she wants with her children. "Maybe she could cast a spell on them to trap them in her home. Because she certainly can't take the risk of them escaping and, gasp, meeting real Christians!" This post prompted the IPFI to a letter to the school board and to the media condemning Lunger and calling for his removal. Lunger has retaliated, and is now in the middle of an Internet flame war. The letter said that parents should know the personal and political beliefs of every teacher, "because some parents might be not want a man who's dedicated his life to spreading the negative energy of a zombie religion as a role-model for their children." "I was stunned!" Said Lunger. "I'm just posting my personal opinion. I don't talk about religion in class. I shouldn't have to give up my personal life just because some parent might be offended. That's no reason to fire me." Hecate said she isn't trying to get Lunger fired. "We just don't want him teaching, working or living within the Valley View School District. That is not the same thing as firing him." Said Hecate. A spokesperson for the school district said that Lunger's job is safe. "The majority of our parents are Christians. We'd lose the next election if we fired someone for being a Christian. Plus we know that he keeps his personal beliefs out of the classroom. Now if he were an atheist blogger in the same situation, it might be different, but we'll deal with that if it ever happens." Though Hecate denies this, sources tell The Babbler that the IPFI sent representatives to speak with Bolingbrook mayor Roger Claar in his home. "He gave them 30 seconds to talk while he was searching the Internet." Said the source. "He told me does searches because, 'there are people on the Internet who are wrong about me!'" After a few seconds, Claar interrupted them to say that he had no authority over the school board. Hecate replied that Claar has endorsed board members, and that gave him some influence over them. Hecate then chanted, and $140 seemed to magically appear in her hands. "The goddess Athena has given you money!" Said Hecate, according to the source. "If you remove Mr. Lunger, you will be rewarded threefold if you know what I mean. And you don't have to report it because Illinois law doesn't cover donations from goddesses!" The source said that Claar stood up and yelled, "This is what I'm talking about! People on the Internet say I accept bribes. That's not true! Now get out!" As the IPFI representatives left, the source said Claar yelled, "If I did accept bribes, you didn't give me enough money!" The source says Claar directed him to donate the money to Citizen for a Better Bolingbrook in Claar's name because, "it will confuse their followers." When asked to comment, Claar demanded to know the names of any Babbler staffers who were also Bolingbrook Jaycees members. When told there were none, he hung up. Thanks to Jon Stewart we all realize a good article that is sarcastic. Good work.